Have you ever thought about the fact that every Yes you say to someone is by default a No to your family? This is something I’ve heard from many different people over the past year, and it always comes to the forefront of my mind when I’m trying to make a decision on a commitment. 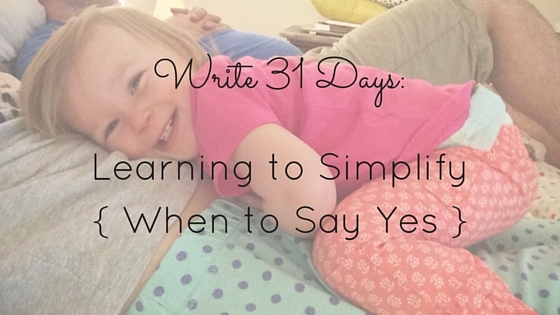 As a recovering people pleaser, “No” has always been a tough one for me. But a funny thing happened after my daughter arrived. The No’s came out more freely and boldly, in an effort to devote as much as I could to her and my newly formed family of three. Settling into a new season of life requires so many adjustments. One major one for me was stepping back from work a bit, just like so many other moms. I work as a Registered Sonographer at a couple of hospitals in my area. Technically my position is “PRN” meaning “as needed.” I know it sounds a little iffy, but in the hospital world, “as needed” is code for “often.” I decided that I would only commit to three days a week after maternity leave, and except for a handful of times, I have stuck with my plan. The welfare of my family is worth protecting, and for me, work needed more boundaries. A big yes that surprised some people? My mission trip to Thailand earlier this year. I had family members tell me with no hesitation that they thought I was making the wrong decision. I can appreciate their concern, but in my mind there is no more worthy a cause to leave my family for. Even though I knew it was the right decision, saying yes to God and Thailand was not easy. My daughter was 14 months old at the time, and had only been weaned for a month. A trek to and from Asia is not cheap. And then we have the emotional stress of leaving your baby for the first time for TEN days to go to the other side of the world, and there are more than enough reasons to say no. In the end, I had more peace with my yes than I ever would have had with a no. God has given me a heart for the people there, and I cannot ignore His call. A) Do I want to do it? Do I feel called to it? Make it a matter of prayer. Even small decisions deserve a consult with God – let Him decide for you. B) How does it fit into my schedule? My family’s schedule? C) Is it worth being away from my family for that time? You’ll notice there are no clauses for things I feel obligated to do, pressured to do, or things imposed on me. I just don’t have the bandwidth to accommodate everyone else’s expectations of me right now. Do you ever feel overwhelmed because you’ve handed out too many yeses? Maybe now is a good time to pull back on the reigns a little and re-evaluate which commitments are worth your time.